Catsparella: Snoop Catty Catt Bow Tie and Lady Cat Bow Giveaway! Snoop Catty Catt Bow Tie and Lady Cat Bow Giveaway! I first met Jane from Snoop Catty Catt (formerly Knots & Knives) right after I started blogging back in 2010. I was drawn to her ridiculously adorable cat neck ties, bow ties, and tuxedos, all expertly modeled by her dapper, now 11-year-old rescue cat, Salvador. (Check out the original interview, which includes more information on Salvador, and Jane's inspiration behind the line, here). The Vancouver-based cat accessories designer has been producing her line of cat ties for nearly two years now, and can attribute their ongoing popularity to fashion as much as function. While many cats, including my own, aren't necessarily comfortable wearing clothing, many will tolerate (or dare I say, enjoy) wearing a little something around their neck for the sake of an adorable photo op. In keeping with that successful formula, Jane recently expanded her colorful line of neckwear to include a little something for the ladies. In fact, she even talked Salvador (the consummate professional) into modeling the gorgeous collection of satin lady cat bows, which are available in a wide range of floral-inspired shades like hydrangea, red rose, and lilac from her Etsy shop. 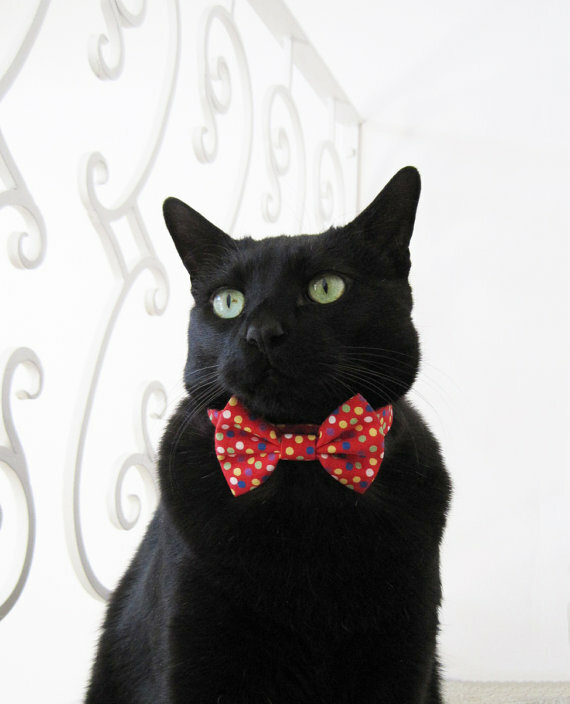 My very own cat Charlie modeling the lovely necktie Jane and Salvador sent us for Valentine's Day last year! 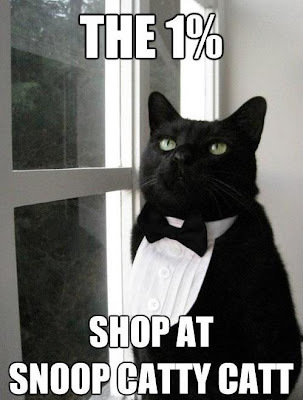 Jane and Salvador have generously offered to give away one cat bow tie and one lady cat bow to TWO lucky Catsparella readers and their kitties! To enter, leave a comment on this post with your name and some way for me to contact you if you win (email, link back to your blog or profile, Twitter, etc.). Also let me know if your cat would like to win a BOW TIE or a LADY CAT BOW. The winners will have their choice of colors, which are available for perusal in the Snoop Catty Cat Etsy Shop. The winners be will chosen in a random drawing next Tuesday, April 24th at 5:00PM EST. This giveaway is open to everyone, so our international friends can participate, too. One entry per person, please. Good luck, and be sure to visit the Snoop Catty Cat Etsy shop, and follow them on Facebook for updates on all of their latest designs!